Each year the Town Council facilitates an Annual Town Meeting (also known as the Town Forum). This is a public meeting, not a Town Council meeting, and is a chance for members of the public to ask any questions of the Council and receive updates on the Council's activities over the previous year. 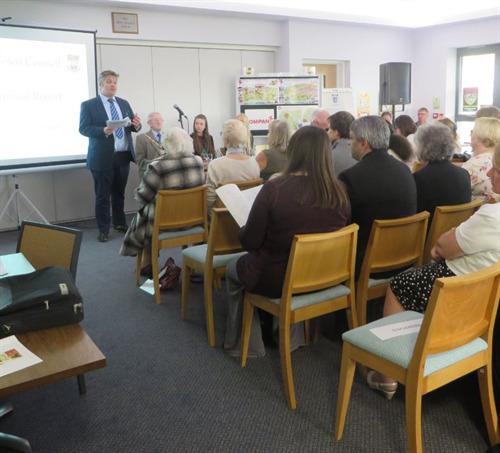 The event also usually includes presentations from charities and organisations that have received financial grants from the Council; giving an insight in to how the money has been spent and the benefit this has brought to the town. The Mayor of Seaford will usually also present the annual Mayor's Awards, which are given to members of the community or organisations that have worked hard for the benefit the town or have overcome great barriers. The prestigious Don Mabey Award is also presented; an award first bestowed in 2014 in memory of the late Don Mabey MBE and his services for Seaford. The Don Mabey Award is given to selected residents of the Seaford community for outstanding services to the town of Seaford. The 2017 Annual Town Meeting is to be held on Tuesday 23 May 2017 at The View at Seaford Head, Southdown Road; the event will open at 6pm, with the meeting beginning at 7pm. 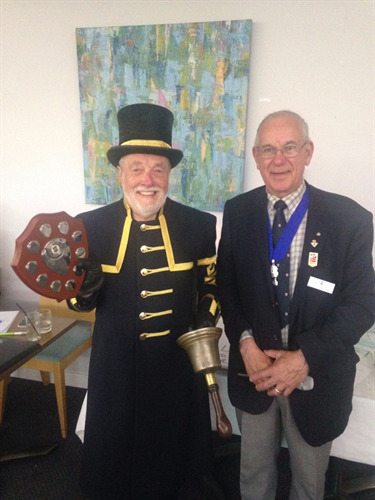 Left: Peter White, Seaford's Town Crier and Sergeant at Mace, receiving the Don Mabey Award in 2016 from former Mayor, Councillor Dave Argent. Right: Presentations being given on the Council's activities and achievements during 2015/2016.